Samsung KE55S9C review | What Hi-Fi? 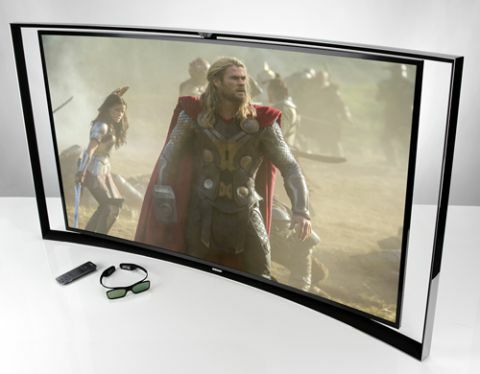 The Samsung KE55S9C curved OLED TV has us very excited. Never before have we tested a curved screen (we're not counting old CRT sets), or an OLED panel of this size. We’ve had tantalising glimpses before now, with prototypes doing the rounds at electronics shows and hands on time in the UK, but now we’ve actually got one in our review rooms. This may be the shape of things to come – but is this Samsung S9C OLED ahead of the curve, or will the radical design drive us round the bend? It’s a striking design, with the OLED panel sitting in a large chrome-plated aluminium frame. The idea is to create the appearance of a floating screen. Samsung calls this the ‘Timeless Arena’ design. What does that mean? No idea. But we think it looks lovely. There’s further visual trickery at hand in that the frame is more curved than the screen itself. This allows for a more radical appearance without affecting the picture too much. It’s an outlandish idea, not unlike a concept car: it’s very cool, even if it might not be entirely practical. For those with a penchant for wall-mounting, here’s a word from Samsung: don’t. The frame also serves as a stand, taking up most of the TV’s footprint. And what a large footprint it is: the frame adds about three inches to the sides of the screen, making the S9C wider than any standard-issue AV stand we have. We didn’t find stability to be an issue, however, thanks to a large support behind the screen. Samsung has clearly learned something from its UE55F8000. The TV is mostly free of connections. These have been moved to a separate hub, the ‘One Connect’ box, which attaches with a proprietary plug and a 3m cable. The only other cable going into the TV is the mains. We like this tidiness from an aesthetic point of view, but it’s also practical. You won’t need to fumble behind the screen every time you want to fiddle with the cables. And it’s future-resistant: Samsung says it’s upgradeable in the same way that some of its TVs get Evolution Kits. There may be a new One Connect box in the future, offering extra processing power and more connections. For now, the offering is generous enough. There’s an aerial socket for Freeview HD and two connectors for satellite – so you can watch one Freesat channel while recording another. Audio output comes in analogue and optical flavours, and there are four HDMI inputs. You can go old-school, with component, composite and SCART, but you’ll have to use the bundled adaptors. A LAN port caters for wired internet, although the TV itself has wi-fi as well. You’ll also find two USB ports, which can be used for recharging the bundled 3D glasses. The benefit of a curved screen is subjective, and, frankly, we’re still arguing about it. Some of us find it immersive, aided by a frame that draws attention to the centre of the picture. Others find it a distracting gimmick, especially when viewing from the sides, where the picture doesn’t taper off uniformly like a regular screen. Instead, the image is distorted according to curvature. Sitting directly in front of this Samsung curved OLED TV, though, we could all agree that it’s a comfortable viewing experience. From here, the S9C’s picture is stunning, and easily in the same league as the Award-winning Panasonic TX-P55VT65B. Contrast is excellent. The whites are dazzlingly bright. Dark scenes are some of the deepest and blackest we’ve seen, genuinely resembling the absence of light. More importantly, the S9C handles light and dark in the same frame very well – certainly more capably than any LCD TV we’ve tried. This may have something to do with the structure of OLED panels, which seem to occupy the happy middle ground between plasma and LCD. As with plasma panels, OLED has self-lighting pixels that turn off to denote darkness. LCD panels, on the other hand, don’t produce any light at all and need a separate backlight to make a picture visible, so dark images can never be truly black. Colours are rich, vibrant and seriously impressive. The picture looked a little oversaturated fresh out of the box, but a quick spin of our THX Optimization disc helps to even things out. Even then the Samsung KE55S9C could be accused of being a touch overdone, but it never looks unnatural. It makes for a punchy, exciting watch, while the Panasonic plasma feels a bit more understated in comparison. Detail levels are very good in most areas. We watch a Blu-ray of Skyfall and there’s a clear sense of texture to everything from Judi Dench’s coat to Daniel Craig’s face. When it comes to the extremes of light and darkness, the S9C could do with a boost in the subtlest detail and variation of shading – the Panasonic edges it in discriminating between shades in both areas. That being said, the tables are turned when it comes to black depth. We’re also amazed by the S9C’s level of clarity. It’s a crisp, clean picture with little discernable noise. Edges are sharply drawn: combined with colours that pop, this makes for an involving picture with an excellent sense of depth. Viewing angles are excellent for colour reproduction. We walked around the TV and found ourselves looking at the TV almost side-on before colours washed out. This is unlike most LCD screens we’ve seen, where the contrast can suffer badly when viewing from the side. Motion isn’t an issue at all, either: the Panasonic is a touch smoother, but there’s not much in it. We switch to a DVD of The Empire Strikes Back and our findings are consistent. There’s an inevitable dip in sharpness and clarity, but we’re happy with the definition. The same applies to Freesat and Freeview HD: the S9C has a very good tuner and strong scaling skills. Time for our first try of 3D on a curved OLED TV, and we load-up The Great Gatsby. Motion is fine, with minimal crosstalk. Active 3D can often be tiring, but we felt minimal eyestrain with this Samsung, and the sense of immersion is certainly convincing. It’s difficult to say if the curve of the OLED screen helps with the 3D or if it’s simply the panel’s skill at portraying depth. Either way, we’re happy to say this is one of the most capable examples of active 3D we’ve experienced. Talking of different types of content, there’s the matter of 4K – the S9C doesn’t support it. Admittedly there is very little 4K content out there at the moment, but we can’t simply ignore this emerging market. It may not be necessary right now, but this lack of specification doesn’t bode well in terms of future-proofing. OLED may be nothing new – we reviewed a £3000, 11in Sony OLED TV back in 2008 – but the S9C is the first time we’ve seen it applied to a big screen, so it’s not inappropriate to treat it as a technological infant. This is a first step of sorts, and it’s seriously impressive. We’re pleased to see Samsung provides a practical reason to use 3D glasses: Multi View. This allows two people to watch different content at the same time. The S9C plays two images simultaneously, and the glasses separate them for each individual. The image is sharp, with good motion, even in videogames. We did find the picture to be noisier, however. This was barely noticeable with games and standard-definition pictures, but higher-quality Blu-ray images have a slightly uneven texture. These glasses are the first 3D headsets we’ve seen that also handle sound. Hidden in the frames are in-ear headphones, which play the TV’s sound through Bluetooth. The sound is a little thin and hard, but you do get different sized ear tips to ensure a good fit. You can choose from any of the TV’s sources. Blu-ray with a videogame? F1 racing with Downton Abbey? Go for it. A button above the left ear of each headset lets you flick between the two feeds. Multi View works. It’s not perfect, but it’s an interesting solution to the traditional fight for viewing options, and we like the innovation. Elsewhere, the S9C is equipped with all the bells and whistles found in Samsung’s higher-end smart TVs of 2013. This includes the Samsung Smart Hub, an attractive interface with five pages of online and local content. You get a wide selection of online apps, Samsung’s own video content (for a price) and anything you have stored on a networked computer. There is also motion control: the TV watches you with the built-in camera and waits for you to wave. A cursor then appears, encouraging you to get all Minority Report with on-screen buttons. It’s fun, but we gave up after an exhausting and unpredictable 10 minutes, and never used it again. The same went for voice control, which had us shouting and swearing until we felt silly. It’s best to turn these off: the TV often gets the wrong idea, helpfully but misguidedly offering to change the channel as you reach for the popcorn. Physical controls work well, though. There are three options: a smartphone remote app, a smartphone-inspired remote control with few buttons and a swipe pad, and an old-fashioned wand with a full selection of buttons. Whichever you choose is intuitive, and very responsive. Also pleasing is the fact that the Samsung KE55S9C sounds very good. As screens have become thinner, their sound has generally followed suit – but not here. There are twin 10W drivers and a single 20W bass driver hidden in the frame, and they put out a balanced, listenable sound. It’s never too harsh or bright, and there’s even a decent amount of weight. It’s perfectly fit for films, and certainly good enough for Countdown. As ever, we’d suggest pairing your TV with a dedicated sound system. Our experience with the Samsung KE55S9C was an enjoyable one. It made a great first impression, and it only got better. As a sign of things to come, it has us very excited. But would we buy one? It’s prohibitively expensive, costing nearly three times as much as our current favourite 55in plasma, which offers a comparable picture performance. And the lack of 4K-support makes us shudder at the thought of being outdated in a few years. And then there’s the curve. It’s eye-catching, some of us really like it, and it makes for a great talking point. But we struggle to call it necessary, and we don’t really understand why we’re seeing curved OLED sets before flat ones. Overall, this is an excellent first step for large-screen OLED, even if it doesn’t offer great value for money. Early adopters will be happy, as long as they have deep pockets. And maybe a lighthouse.